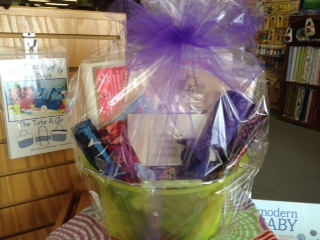 Kudos to shops who had everything put together in time for shop hoppers to see their baskets. 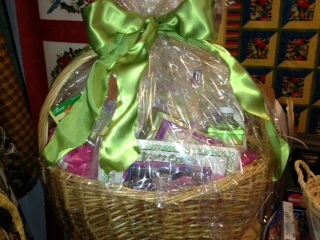 Of the 32 stores, 24 had their baskets made up. 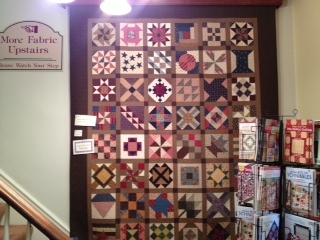 Quilter’s General Store in Rockford. It’s For Quilting in Rockford. Roberts Sewing Center in Crest Hill. It’s a quilt pattern, with all the fabric in a kit. 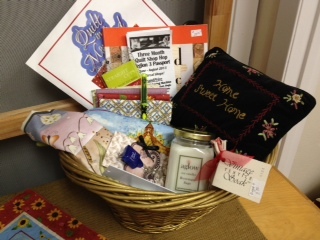 Northern Illinois Quilt Shop Hop Complete! Whew! 32 shops. 32 small business owners. 32 sets of directions from the GPS. 78 fatquarters purchased, 10 yards of fabric, 5 books, 4 wool packs, 2 boxes of stationery, 2 charm packs, 2 bracelet charms, a bottle of hand lotion, 1 seam ripper and a “purple thang” (which I still cannot find.) 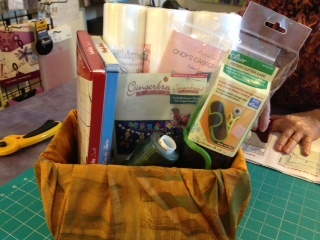 Oh, and a pattern, notions and fabric for my mom to make a handbag. This is enough to keep me busy all winter and beyond. Special shout out of thanks to my Reluctant Assistant– my 10 year old son– who tolerated and entertained me along most of the way. Don’t worry, he’s getting a quilt made of snack food fabric out of this! Very big, bright store with loads of fabric. I wanted to spend more time there, just browsing. They told me that they are featuring more events, so lots of new growth and exciting things happening at this store. 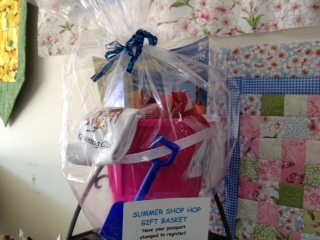 They did not have a shop hop basket made up yet. What I bought: A Kaffe Fasset book, sale fabric. Reluctant Assistant comment: Not present. What I bought: More fatquarters. This is a large shop that also sells Janome machines. I had picked up my mom prior to this shop and she found some lovely fall fabric to make a handbag. Everyone was very helpful. Their shop hop basket is not a basket at all. I thought this was rather brilliant. 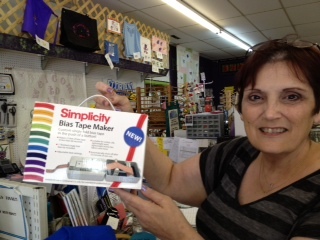 Their raffle item is a bias tape maker from Simplicity. They also have someone who sharpens scissors and travels to area Joann’s Fabrics to sharpen scissors, including the one in Geneva Commons. What I bought: Some striped fabric and the handbag pattern etc for my mom. 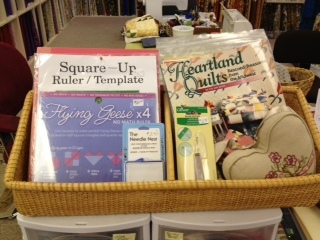 Alas, we still have 3 more shops in Region 1 before we complete our Northern Illinois Quilt Shop Hop. We were able to head out to the Rockford area again yesterday, and frankly, we are getting smarter about these long drives. Now we pack a cooler with lunch and snacks, we chit- chat about the scenery and the history of the area and also about the shops we are visiting. With 29 stores behind us, we have some solid knowledge about store layout, fabric availability, and to be honest, we have noticed some major differences in shopability (if that’s a word!) When we completely finish, I’ll do a summary blog with general thoughts. 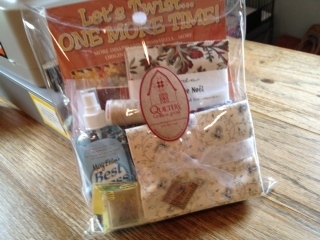 Set in a farmhouse, the quilts, samples and fabrics are laid out in the style of a very charming tour house. You start in the kitchen, enter the living/dining room area and can even go upstairs into a child’s bedroom. Near the stairs they had a civil war quilt that finally gave me the inspiration to embark on a civil war quilt. Generally speaking, not my style, but the accompanying book by Barbara Brackman included the history of every block. I got pulled in. Quilter’s General Store in Rockford. Civil war blocks. 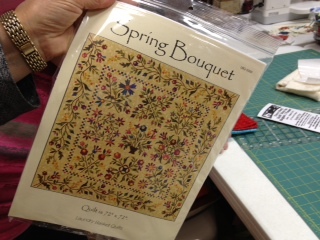 What I bought: Barbara Brackman’s Civil War book, along with some fabric to work on the blocks. I also found a hand embroidery guide with instructions for all types of hand embroidery stitches. This shop is set in a little more congested area of Rockford, though only 10 minutes or so from the last shop. There were a number of shoppers in the store, even though it was a quiet Wednesday. This store was busy. The shop is under new ownership – this owner has only been there 1 week. But the shop itself was nicely put together. They do have a lot of reproduction fabrics and some kids/Halloween stuff. No shop hop basket yet. What I bought: A Civil War book and some stationery. A little tricky to get here. Follow your GPS, but know that they are technically on 251, you just have to pull into the service road to get there. Our GPS took us round and round in a circle just near the place, but we finally had to call. 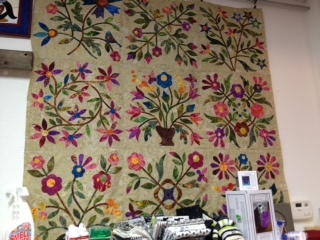 The shop has many beautiful reproduction fabrics, including Barbara Brackman. But they also have some 17th Century French reproductions. I took note, because I would love to come back soon and take another look. Since I did not have a plan for that fabric, I did not buy it. But once I got home, of course, an idea came to me. 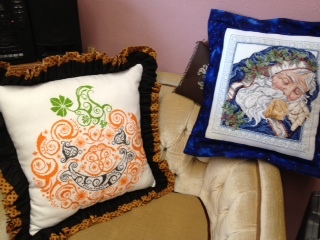 They also have some reproduction fabric that gives a portion of the sale to Habitat for Humanity. Before we headed back, I noticed that just 2 doors down from Julieanne’s Quilt Shop, was a little cross stitch shop called Just One Stitch. I thought, what the heck, we’re all the way out here. So we stepped inside and found some of the most beautiful cross stitch work I have ever seen! Everything in the shop was created by a mother/daughter team who must have worked endlessly on these pieces for most of their lives. Honestly it was lovely, so I am sharing some samples, with their permission, and be sure to stop in when you are in Roscoe. The work is just spectacular. My Reluctant Assistant and I finally headed out on Region 3 of the Northern Illinois Quilt Shop Hop. For those of you who are unfamiliar, Region 3 spans the greatest distance. It starts in Clare and heads out to Galena, back through Rockford. We totaled over 250 miles on our car yesterday. Ambitiously and unrealistically, we attempted to do the whole region in one day. Alas, some of the stores toward the end close at 4 pm , and we just couldn’t physically get there in time. So we will be making another trip out to the Rockford area very soon. We both have to admit that even though we spent a lot of time on the road, this trip was very enjoyable. The scenery is lovely as we headed farther west, and we stopped in some towns that I did not really even know existed. I find it somewhat depressing that many small towns just aren’t what they used to be, and many had empty storefronts that were clearly affected by the recent economic downturn, along with many other factors, I suppose. But that will have to wait for another blog post, as the quilt shops all seemed to be thriving and very well-stocked. My advice: Take your time through these little towns and really experience them. Like us, you don’t have to complete it all in one day, and you’ll get to experience a piece of Americana. 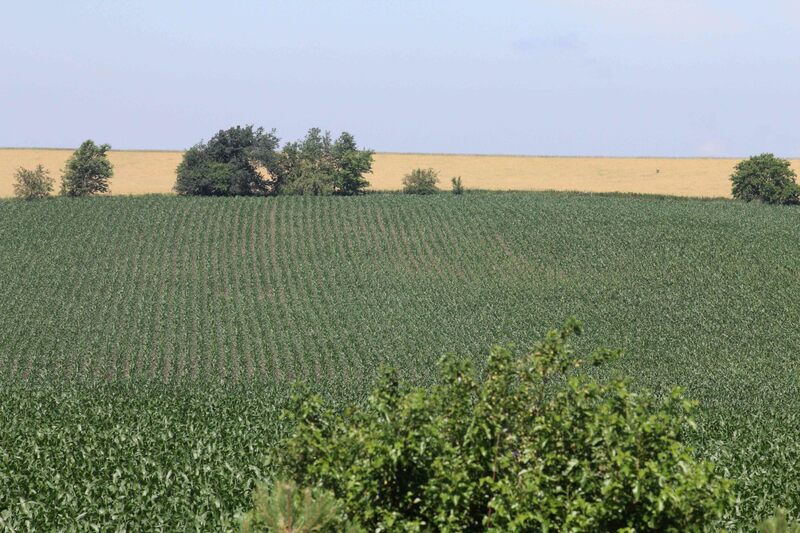 When you find yourself in the middle of cornfields and think you are hopelessly lost, then you are almost there. The view from the parking lot at Basketcases. The store is on a farm, in what looks like a barn. Very charming. The bulk of the product is upstairs, but be sure to look around everywhere. 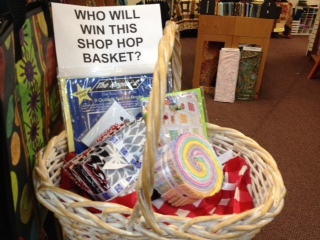 They did not yet have a basket created for the shop hop. Located in a wood frame house setting, this is a very inviting place on the outskirts of Rockford. Small rooms inside the building can keep you hunting for hours, but we did not take that long! What I bought: Several fatquarters and a “purple thang.” But for the life of me, I cannot find the “purple thang.” I’m sure it got shuffled around in the course of the day, and for all I know it is still stuffed in my car somewhere. For now , it is in the Bermuda triangle that was the Region 3 trip. A vibrant little quilt shop in this small town. 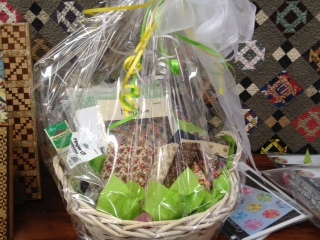 I got excited about their basket for the shop hop. This is the one I really want to win, so far. 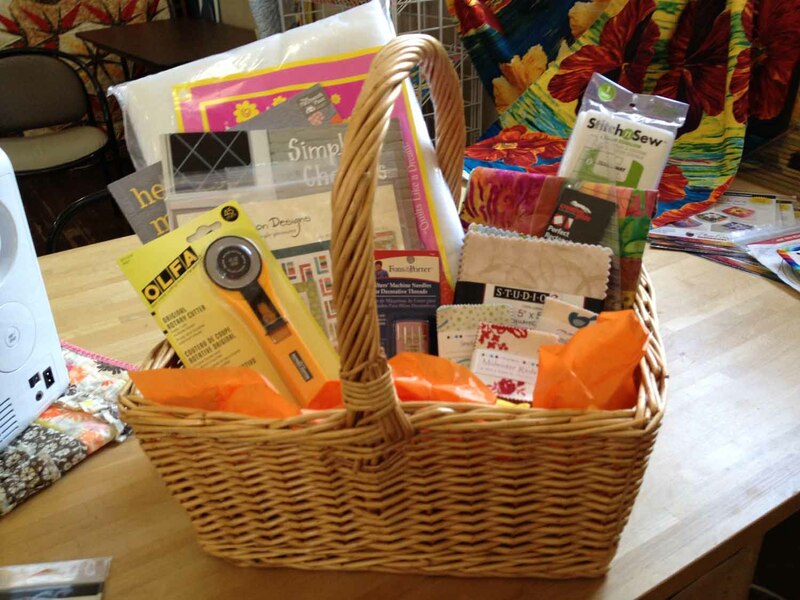 Their basket is 3 blocks from one of Edyta Sitar’s Laundry Basket Quilts patterns. 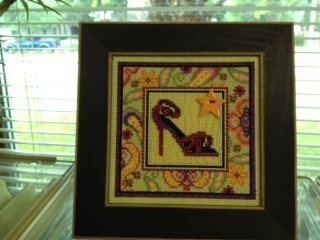 The basket includes the patterns and the laceys (laser cut appliques) for the 3 blocks. Laundry Basket Quilt Pattern – 3 blocks included in Lucky 2B Quilting’s Shop Hop Basket . 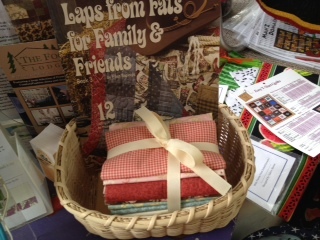 This quilt shop is partnered with an antique and gift shop called “Sew Many Antiques”. The two owners are sisters, and they have written a number of books. The owner promised to ship me a signed copy of her latest book, which she is also hoping to add to her shop hop basket ( a new shipment of books was due to come in soon.) Also, ask her for directions to Galena. Her route is very direct, and takes you right to 20 and into the heart of Galena. Your GPS will likely take you on a very long ride. What I bought: A couple of quilt charms for a charm bracelet, some hand lotion (they have their own label) and a copy of the owner’s book. This is a very tidy store that I have visited once before when they were in a different location. They moved to the main street in Galena and are right in the heart of things now. The store itself has a lot of Bernina accessories, with a large classroom in the back. What I bought: Some fabric, and a small Bernina measurement guage that I had never seen before. Galena, of course, should be a day trip in and of itself. The day we were there, it was over 90 degrees, so while it was not raining, it was certainly sweltering. We stopped first at Chocolat where I got my self a bit of chocolate. If you go, try the strawberry rhubarb dark chocolate truffle. Almost worth the 2 hour drive by itself. Next stop for us was the Candy Kitchen in Galena, an old-fashioned candy shop, complete with kids in front of us paying with nothing but nickels and pennies. My son wandered through here for awhile. 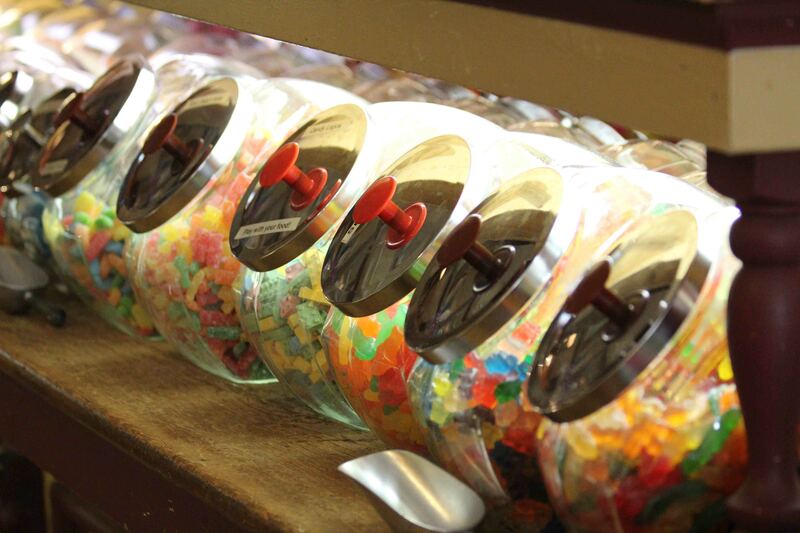 Being from the suburbs, I don’t know if he’s ever really seen a penny candy shop like I knew growing up. I think it was a real treat for him. The next stop was Orangeville. My GPS did not recognize the address of this quilt shop, so I called there and the gal working could not give me directions. So I had my GPS get me to the general area of Orangeville and told her I’d call back then. The route from Galena takes you onto Meeker, and then onto a road called Stagecoach Trail. And it is almost exactly the way it sounds. It’s a two lane highway that swerves and curves its way through very picturesque farm country and is a real delight. The day we drove through, we had clouds moving in and out of the sunlight casting artful shadows over the hilly terrain. Once you are in Orangeville, be on the lookout. It’s probably best to call for directions. You literally pull into a side street that turns into a gravel road that leads to the driveway of the quilt shop. The shop is in the basement. Oh, and don’t mind the sign on the street that says Dead End. This quilt shop is in the lower level of what looks to be a home. They have a wide selection of fabric and even some that I have never seen before. 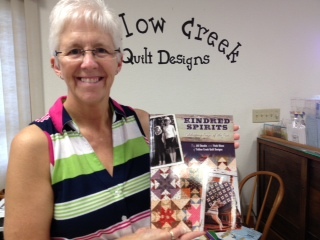 They also have a very large selection of patterns and books. What I bought: I found more of the fall fabric that I have been collecting. Finally made another quick visit to Thimbles in Lockport and that completed our Region 2 portion of the Northern Illinois Quilt Shop Hop. We’ll be moving on the road again soon, but with temperatures shooting up into the 90’s over the next few days, I think we’ll be cautious about how far we head out. We are actually going to try to do Region 3 in one day. That’s a trip out to Galena and Rockford. We’ll see how that goes. I enjoyed myself here. The store is a delight – lots of samples and fun fabric, charming to wander and discover. Staff was welcoming and friendly. 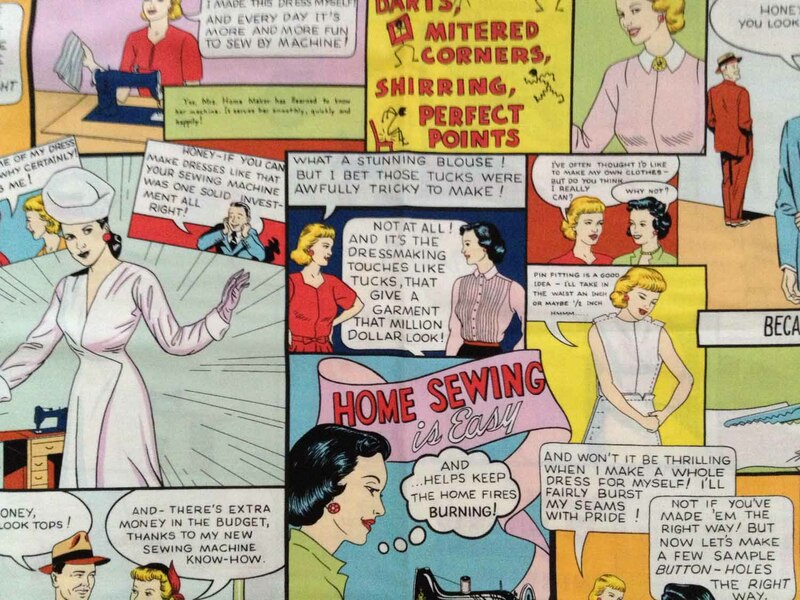 What I bought: This fantastic cartoon fabric all about home sewing. They had a sample of it made into a bag and I loved it! Continuing with our summer road trip to 32 quilt shops as part of the Northern Illinois Quilt Shop Hop, my reluctant assistant and I managed to get in another 2 shops. It would have been 3, but I’ve come to realize that I will likely NEVER remember to double check a store’s hours and days when they are open. For the record, Thimbles in Lockport is not open on Tuesdays. With over 7000 bolts of fabric, they bill themselves as “A Quiter’s Paradise”. The store actually looks rather small as you enter, but take a look at the next room! It’s almost a warehouse of fabric! My reluctant assistant took off like a shot to find some fabric he was looking for, and I was overwhelmed. 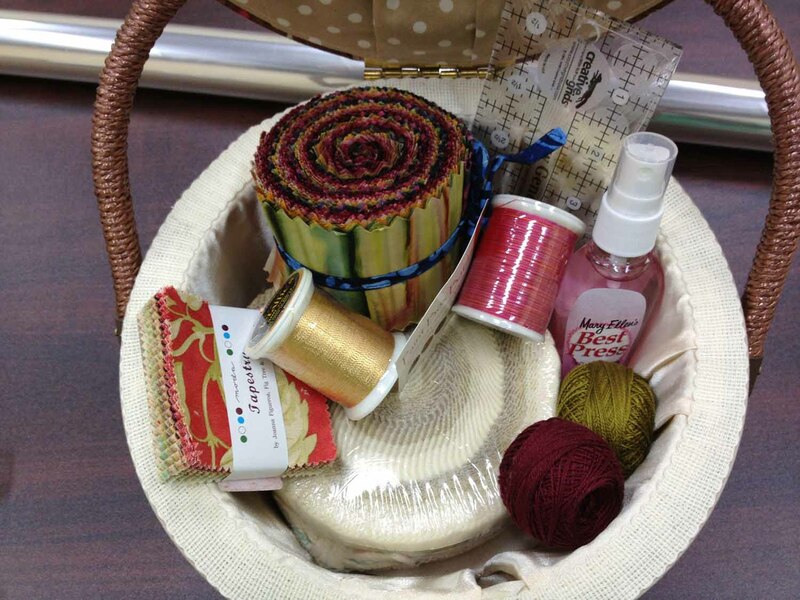 What I bought: Serger thread, fabric, and a book on hexagons. Light, airy place with fresh fabric and friendly staff. This is my home base, by the way, so I may be a bit prejudiced. My reluctant assistant feels quite at home here, as do I. This much I know: it would be hard to find owners who are kinder or more eager to help customers. It would be hard to find sales people who are more knowledgeable or better co-workers and friends. Enough from me. What I bought: On this particular trip, I bought the fabric for a “transparency quilt” for my nephew’s baby-on-the-way. Third time was the charm. We swung by A Touch of Amish in Barrington once before on a weekday shortly after 4 pm. They close at 4:00. Then we headed in that direction on a Monday. They are closed on Monday. Finally, my Reluctant Assistant and I agreed we would try again, and call before we go. We also decided that today we would only attempt ONE shop. We would take our time and enjoy their goods. And then go home–instead of trying to cram in more shops along the way. Barrington, of course, is a lovely town. We did eat lunch at their Egg Harbor Cafe, which is always a yummy place to go. And then, brilliantly, came home. 18 more shops to go. Their web site boasts that they are the oldest quilt shop in Chicagoland. They also claim to have the most fabric, but I think that some of the newer quilt shops in the area may be giving them a run for their money with that title. What I bought: Kaffe Fassett fatquarters, and some raspberry and orange fabric. Not very Amish, I’m afraid. But then, of course, neither are we. Three days. Three days was all it took. Three days of driving around the suburbs looking for locations and I finally let loose a string of profanity so clear, colorful and resounding that my 10 year old in the back seat learned correct grammatical usage and tense. After driving to four quilt shops, two of them being CLOSED–(Note to all shop hoppers: check to see what days the stores are OPEN. )–and after inhaling the dust from my neighbor’s newly installed stone driveway for three days, we ran into more construction on the way home. 38, also known as Roosevelt, goes down to one lane between Winfield and St. Charles. The signage gives drivers plenty of time to merge. However, you know how it is. Someone always thinks that where they’re going is more important than where you are going. So they zoom all the way to the end of the lane that’s ending then cut in front of everyone to get back in line. Today, I found myself inching over the middle line to prevent the zoomers. I never do this. And I don’t recommend it. But you’ve seen this too, people like me who get tired of being cut off and attempt to stop others by blocking the second lane. Well, needless to say, someone came up behind me and laid on their horn, eventually swerving out into the emergency lane to go around me and cut everyone off. I knew it was time to go home. My husband told me a story about the same type of thing happening in front of him on 64 (where, if you don’t already know this, is a construction nightmare on the east side of St. Charles). He said one car moved over the middle line as lanes were closing, blocking people from cutting others off. Of course, someone else attempted to go around the vehicle on the passenger’s side. Then he said the passenger of the first car swung open the door as the other was attempting to pass. Interesting tactic. Luckily, no one was hurt. I almost forgot to mention. As we passed the intersection of Arlington Heights Road and Rand Road, I heard a huge crash. Uh-oh. I reached the front of the intersection. Yep. It became clear that a pick-up truck had hit a car. The woman inside the car was crying hysterically. She had at least one child in the back seat. The front lefthand side of her car was crunched like a paper bag. I could plainly see she was wearing a seatbelt and the air bag had engaged. Instantly I reached for my phone and dialed 911. There was no way for me to jump out to assist without causing the potential for more accidents. If you’ve ever seen the amount of traffic at Arlington Heights Rd and Rand, you understand. Shop Hoppers, be careful out there. It’s crazy. Drivers are unpredictable, traffic and construction is maddening. The main goal is to stay safe. I’m reminding myself. I’m reminding you. Now on to today’s shops. One of the largest shops I’ve seen. Lots and lots of fabric and notions and thread. They had a class in the back that must have held 60 people. 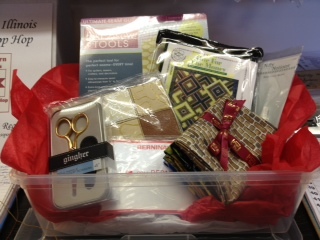 They sell machines, Bernina and Babylock from what I could tell.They did not have a basket prepared for the giveaway. A charming store, very inviting. Mostly traditional fabrics, but a nice selection of brights and batiks in the back. 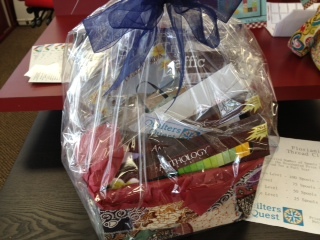 They did not have a basket prepared yet for the giveaway. I managed to squeeze in another four stores this weekend…found the ones that were open on Sunday and headed out. Alas, I did not bring my sidekick with me this time. He was devastated. Not. Nevertheless, I was able to navigate these few on my own. Lots of fun novelty fabric, including plenty for children. I noticed many children’s patterns too. She also had a nice selection of batiks. Active shop for a Sunday afternoon! What I bought: More food fabric for my son’s soon-to-be-quilt featuring all snack fabrics. Reluctant Assistant comment: Not present, but he would have loved the novelty prints. Heading over to Oswego, just thought I’d mention this little tidbit for those of you who like to imbibe: The Fox Valley Winery is en route from Batavia to Oswego, on Ogden. I was so tempted to stop but unfortunately, I had to keep moving. But now I know where it is! I’ll be back!!! Very traditional. But I loved the furnishings and the layout, it was all inviting. While it has some modern fabric, it’s clear they specialize in loads of traditional fabric, lots of browns, maroons, very warm and rich. Large selection of wool in colors I don’t normally see. 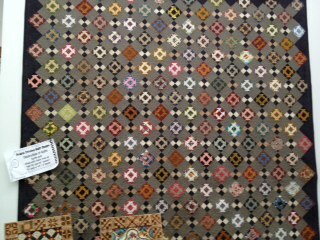 My eye was drawn to a quilt on the wall made from their “ugliest fatquarters” contest. 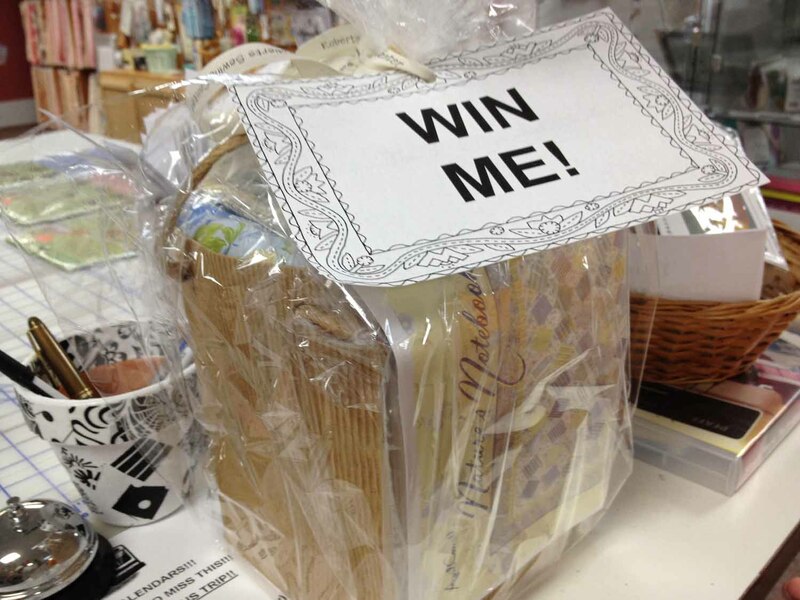 It’s currently a raffle quilt. Reluctant Assitant’s comment: Not present. Raffle Quilt made from “ugliest fatquarters”. Prairie Stitches in Oswego. This is a brand new shop–been opened about a week now. They have 2000 bolts of fabric, with a goal of getting up to 6000 in the near future. They sell Bernina machines and they also have just about the largest longarm in the back that I have ever seen. They do not have a sign outside yet, and Woodridge will not allow them to put anything up outside. Follow your GPS, then look for the Wood Craft shop. They are to the left of it, behind the Baker’s Square. What I bought: Fabric and some quilt stationary. Reluctant Assistant’s comment: Not present.